Patients should be allowed to access data generated by implanted devices. I can’t access the data generated by my implanted defibrillator. That’s absurd. I am a cyborg of sorts. A built-in computer running proprietary software monitors my every heartbeat. But the data it records via sensors in my heart is entirely beyond my reach. It is wirelessly transmitted to a monitor set up in my bedroom and sent via telephone lines to the manufacturer’s data warehouse, bypassing me altogether. I have a cardiac rhythm device known as an implantable cardioverter defibrillator, or ICD. Every seven years or so, the battery becomes critically low, and the device must be surgically removed and replaced by a new one. The lead wires that connect it to the heart are left in place and plugged into the new device. Cardiac rhythm doctors refer to this routine procedure as a “generator changeout.” Although considered surgery, it is an outpatient procedure that some patients see as an opportunity to get an upgraded heart device with newer features and better technology. Not me. When it comes to implantable electronic devices, I think it is too risky to be an early adopter. 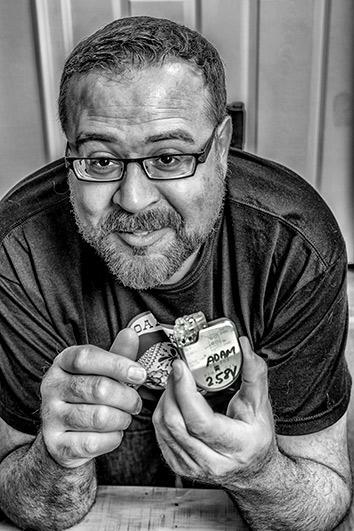 I am due for a “changeout” within the next few months but haven’t yet committed to the device that will watch over my heart for the next seven years. In part, that’s because none of the options seem very good. I want to be able to use the data collected by my implantable defibrillator in the same way that I am able to use the activity data from my Fitbit tracker, the electrocardiogram data from my AliveCor heart monitor, and the blood pressure data from my Withings blood pressure cuff. But that’s not an option. The high-fidelity data collected by my $30,000 Class III medical device is off limits to me. Though we live in a world of smart homes, wearable sensors, and the Quantified Self, patients still do not control the health data collected by their implanted medical devices. Remote monitoring of ICDs, for example, remains essentially unchanged ever since transtelephonic evaluation of pacemakers was first introduced in the early 1970s. 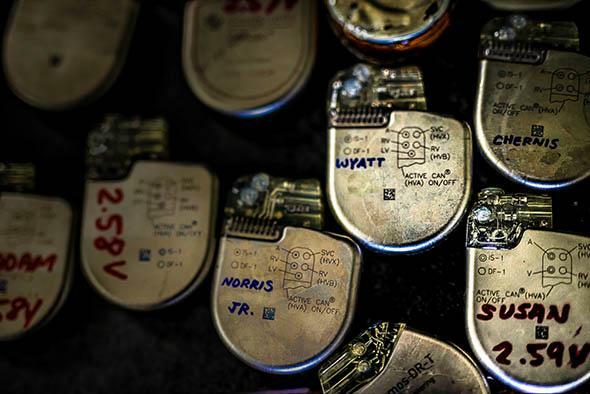 ICDs are in a class of cardiac implantable electronic devices that also includes pacemakers and implantable loop recorders. According to Irish medical-device maker Medtronic, there are about 800,000 ICDs in the United States, with 10,000 new devices implanted every month. Mine was placed in 2007 after I was diagnosed with hypertrophic cardiomyopathy, a genetic heart condition that increases my risk for a sudden cardiac arrest. The device regulates the beating of my heart and delivers high-voltage shocks to treat life-threatening ventricular arrhythmias should they occur. In addition to delivering electricity to the heart, the ICD also collects large amounts of data about itself and a patient’s clinical status. The data is momentarily kept in the device’s memory before being transmitted wirelessly to a bedside monitor. From there, it is sent via telephone lines to the device manufacturer for evaluation. This process, known as remote monitoring, happens automatically in the background, usually while the patient sleeps. Medtronic, Boston Scientific, St. Jude Medical, and Biotronik, the top four manufacturers of cardiac implanted electronic devices doing business in the U.S., all have their version of remote patient monitoring. Not one of them gives patients access to the data they collect. Doctors, on the other hand, have 24/7 electronic access to reports about the patients in their practice. The reasons patients are left out of the equation are numerous, including regulatory and liability concerns. But at the center of it all lies the fact that to manufacturers, the doctor is king and most doctors aren’t asking for data to be shared with their patients. I also suspect that companies fear that giving patients their data may cut doctors out of the care circle, resulting in a loss of revenue. So patients remain without online access to their own heart data and tethered to the clinic for hard copies of reports. This antiquated model is a significant barrier to self-care. But above all, it violates our individual right to autonomy and self-determination. Thirty years ago, Tom Ferguson, an M.D., wrote “The Seven Rules for Better Health” in Mother Earth News. Ferguson was revolutionary in the way he recognized that patients were responsible for the great majority of their illness care, providing their own care between 80 and 98 percent of the time. “You are already your own doctor,” he wrote. As a person living with a chronic heart condition that can lead to sudden cardiac death and congestive heart failure, I know firsthand the importance of autonomy. This became clear to me during the 14 months when I found myself without health insurance—a scary place to be for a person living with an embedded computer that requires follow-ups in three-month intervals. I had been self-employed for many years and on my spouse’s employer-sponsored health plan. But when I needed to buy my own health insurance coverage in 2012, I was promptly turned down due to my pre-existing condition. But I was unwilling to accept being denied the ability to care for myself. So, if the health care system would be unavailable to me, I decided to figure out a way—even if it was radical—to download information from my ICD without being coerced into paying thousands of dollars for routine reports. The solution was to buy a pacemaker programmer, a medical device used by the clinic to program ICDs, which I soon found on eBay. I also spent two weeks (far from my home in Oakland, California) in Greenville, South Carolina, taking a course on the fundamentals of cardiac rhythm management. The class, held at the Arrhythmia Technologies Institute, gave me a basic but solid understanding of how ICDs and pacemakers worked. The class and the programmer, both of which I paid for out of pocket, gave me access to my implanted device and restored my autonomy and right to self-protection. Cardiac device data is as important to heart patients as blood glucose data is to self-monitoring of diabetes mellitus patients. Years of self-tracking have helped me to identify the consumption of Scotch whisky as a trigger for atrial arrhythmias, and of caffeine as seemingly beneficial to my heart health, a finding I did not expect. Access to device alerts and other information would allow for the early identification of adverse events and enable swift corrective action to be taken by the patient. If patients already spend most of their time engaged in self-care, we must recognize their autonomy and empower them for success. Patients shouldn’t have to go to such extremes as buying medical devices at online auction sites, as I had to do, in order to gain access to their health data. We must transform the current system into a patient-centric model that educates, equips, and empowers individuals—not just the doctors who care for them. We cannot be truly patient-centered until we have full control over our health data and the devices that keep us alive.